Psoriasis is a chronic disease that develops when the immune system sends faulty signals that tell skin cells to grow quickly and abnormally. New skin cells form in days rather than weeks in a disorganized manner that can damage healthy tissue and cause serious discomfort. As these cells grow, they pile up on the surface of the skin causing patches or ‘plaques’ to appear. Psoriasis is primarily a disease that happens to people who have a gene that makes them prone to psoriasis. Psoriasis is not transmitted from one person to another by touch and even though it may resemble certain contagious skin disease, it is not contagious. Our dedicated team of pharmacists, nurses, and technicians are uniquely qualified to assist patients with all aspects of their specialty medications including coordination with physicians and insurance providers, all while providing streamlined, comprehensive care to patients. Best of all, patients have 24/7 access to our on-call pharmacy support team and can expect their medication to be delivered to the front door with no extra costs. Asthma is set off by “triggers”, including environmental factors such as allergies (pets), pollen, mold, cigarette smoke, and poor air quality. An asthma reaction is the bronchi (airways) spasms and constriction (tightening) while an increase of secretion (fluid) production occurs in the lungs. This makes it difficult for the body to properly exchange air (oxygen and CO2). Our goal for patients is to be symptom free and that starts with education and training. Learning and avoiding asthma triggers is essential. Compliance and adherence to the use of inhalers and oral prescription will create a momentum towards stabilization. Caregivers and family members participation is crucial to Paragon’s Asthma treatment program; which strives to provide a safe and healthy environment for those impacted by this disease. Paragon Healthcare Specialty – Advancements in Medication regimen and options in the last 20 years has made the quality of life better for those living with PAH. Patients once limited to a 24/7/365 continuous, non-stop infusions of a very potent vasodilator (prostacyclin) now, have options that provide greater freedom and mobility. Our goal is to work in cooperation with expert Pulmonologists across the U.S. to provide the best quality of care. Gaining access to all available forms of treatment: SQ, infused, inhaled or oral, is primary in giving our patients the best path forward in combating this debilitating disease. Paragon Healthcare Specialty– A holistic approach to the management of MS is the key component to our treatment protocol. Not only is our goal to modify the course or manage symptoms, but to better control the relapsing-remitting episodes’ severity and duration. A team approach to develop a care plan that goes behind medication management but includes exercise, diet and depression oversight provides for healthier and happier patients. HIV (Human Immunodeficiency Virus) a virulent transmittable virus that leaves patients with a weakened immune system (your body’s ability to fight off infections) that’s highly vulnerable to opportunistic infections. It is estimated that 1-2% of the US population may be infected. Once considered a fatal diagnosis; a vigorous pipeline of specialty drugs has dramatically decreased the number of deaths and changed the course of treatment. Though treatment options have advanced significantly, adverse side effects (ASE) and treatment adherence remain the biggest challenges. You have a choice in who provides your infusion services. Tell your provider that you would like to use Paragon as your specialty pharmacy. After your benefits have been approved; we will evaluate your needs, create a plan, ship your medication to your door, and help you learn to infuse at home. Paragon Healthcare is dually accredited by URAC and the Accreditation Commission for Health Care. URAC is a independant, nonprofit accreditation entity founded in 1990. URAC’s mission is to advance healthcare quality through leadership, accreditation, measurement and innovation. ACHC is an independent, private, not-for-profit corporation established in 1986. 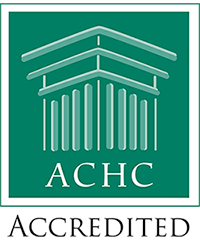 The association for Home and Hospice Care of North Carolina established ACHC to ensure quality, patient-focused, clearly written accreditation standards for in-home aide services.